John & Joy lead the curent management team and are among our regular MCs (or hosts). 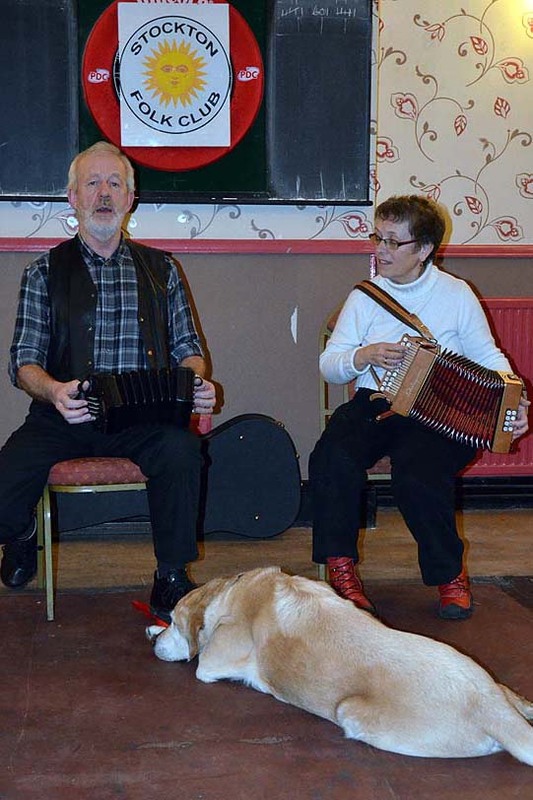 They perform as Dogwatch and are shown with the late Ashley, silent member of the group. 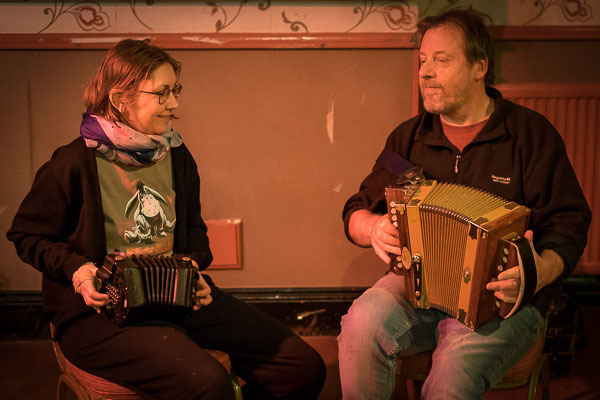 They both sing, accompanying themselves on concertina (John), melodeon, keyboard, recorders (Joy). 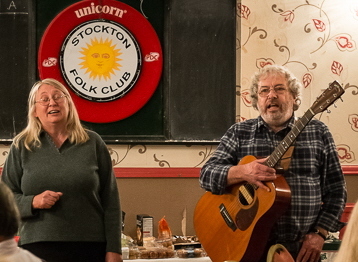 Some of their best songs are poems set to music by Joy. Listen. 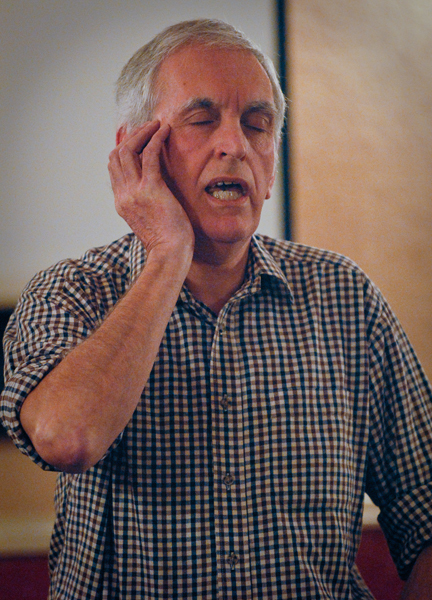 John is the other member of the management team and a regular MC. He sings and is an occasional whistle player (although rarely outside the comfort zone of a knurdle) The pose reflects his theme song "I've forgotten the words". Sylviane Bartkowiak & Richard Featherstone have taken over leadership of the "knurdle" and can be relied to provide driving tune-sets. Sylviane also sings and plays a set of Flemish bagpipes. 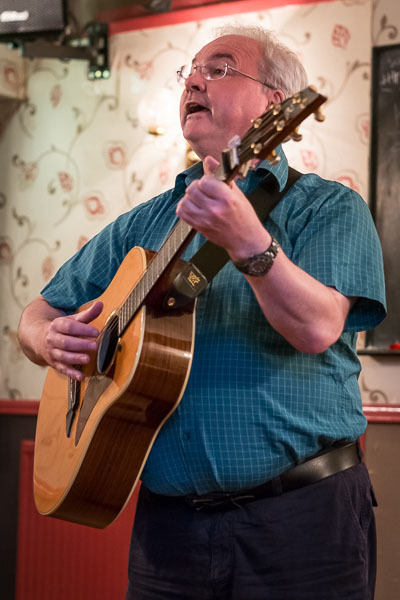 Another of our regular MCs, Steve is a fine singer who produces well-honed guitar accompaniments but is equally at home singing unaccompanied. 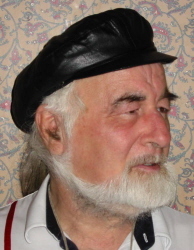 He also plays the hurdy-gurdy. 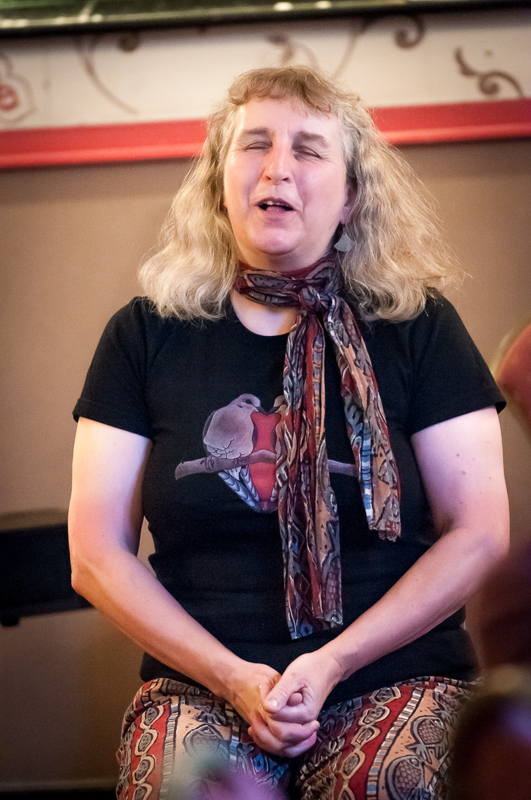 Listen Sue has a penchant for pastische and parodies and other humorous songs but she can put across the original traditional songs in fine style too. We can't show photos of all our regular performers. From time to time they appear on our Gallery page.Other frequent to regular performers include Maurice Bateman; Trevor Bond; Tony Curtiss; Phil Donegan; John Doyle; Denis & Freda Dunning; George Featherston; Brian Fisher; Carol Lamb; Michael Lea; Mike Lewis; Jenny Parkin; Lesley & David Smith; Diane Taylor; Dave Turner; Geoff Walker, Rob Watson and John Wilson ... We should also mention our raffle-ladies, Lin and Freda. Apologies to any I've overlooked.